If you resisted the temptation of MIJ earlier this year, then BBC4 TV has the documentary part of the box set available on BBC iPlayer, having screened it last Friday – which must mark a record of shop to screen. Ann made me watch the last bit of it (it still hurts to see these jobs being done poorly – photocopied record sleeves badly lit, where’s Ken Morse when you need him?) 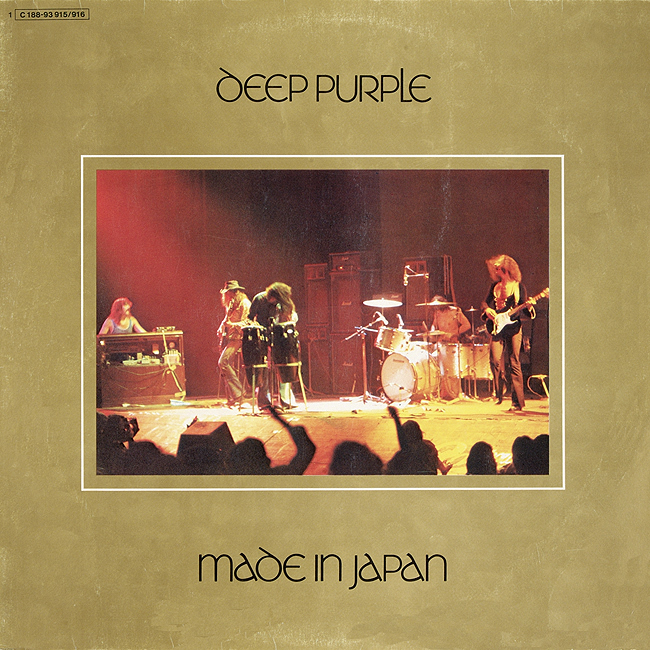 then we stuck with the repeat of the first part of the Metal Britannia which has a good chunk of Deep Purple history in as well, and a typically great Jon Lord interview. Gave up when the spandex started appearing! There are now over thirty reviews of the new box sets on the site, and Tonny Steenhagen has done a really great in depth analysis of the pros and cons of the big CD box for us. 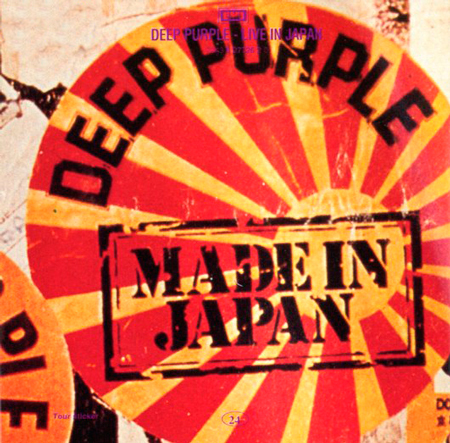 While we’re all Japan 72 fixated, we have a special DTB article devoted to Marshall engineer Ken Flegg, who actually built the desk they were using for the first time on those Japanese shows. He was flown out to look after the gear in case of any teething troubles, and has put together his recollections about the visit. 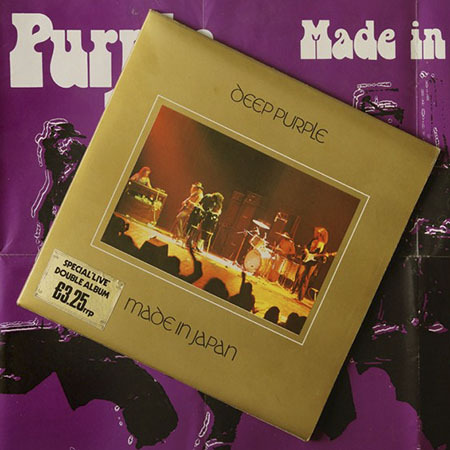 Deep Purple’s recent show at the Budokan was filmed and recorded officially for what we assume is an upcoming release. 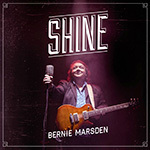 Full set list (which still includes the five new songs as well as most of the original MIJ) is on the tour date page. Shall we start a Yougov petition to get Steve to change his solo track? X number of signees and they have to debate it in Parliament! Yep, that’s inflation for you. 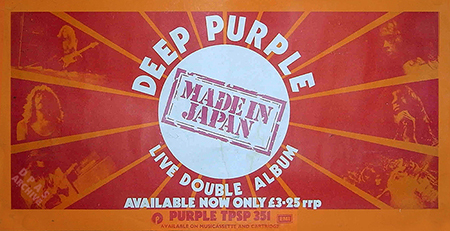 The final plans for the Made In Japan reissue have been released and add up to twenty discs spread across five different editions, the star of which is the nine vinyl disc box set. Actually the prices haven’t been announced yet (which will give us time to get used to the idea I guess) but based on the label’s recent very high dealer prices it ain’t going to be cheap. In essence it’s three shows remixed, but if you were hoping to have all the shows in sequence on CD then forget it, it’s vinyl only for that option. Anyway, we’ve done our best to make sense of all the formats and you can see more pictures and read the details on the site here. How did we know it was £3.25 back in 1972? Here’s the in-store poster… I can’t even get the bus into town for that now. The NME is running a poll on their website to determine the best live album of all time; with Made In Japan currently at number one slot. Not sure when the poll ends (maybe it’ll roll on for ever, they update it every half hour), but it’s easy to enter and you do not need to register on the site to vote. Thanks to Stephen Clare for spotting this. A ticket for the original show has been added to our growing Concert List section as well. Bits and bobs new to the site; a look at the new Double Trouble vinyl hardback reissue, a really high-quality release; a Greek 6CD on-pack set in replica covers (see the press advert above); and a setlist for the recent rockin’ Xmas concert in Berne.